Horizon Dental understands the importance of an attractive smile. We also know the value of healthy gums and teeth. We make it our goal each day to provide the necessary tools, care and precision to help you and yours achieve a healthy, beautiful smile. Patient Education is an important aspect of our practice. 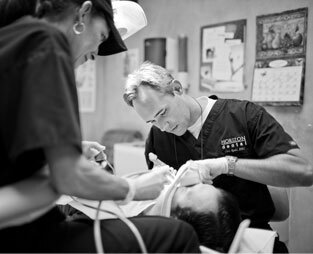 We invite any questions that can help you gain a better understanding of procedures, results, and more. Click here for a dental video series to help you learn a quick overview on a number of topics with Get My Smile. :: "Anybody with dentures should get implants. It is by far the way to go. Veneers are porcelain wafers that are laboratory fabricated and are bonded onto the tooth. They are highly esthetic and lifelike. They are designed to correct colors, sizes, shapes, spaces and alignments of teeth. They are stronger and more durable than composites. Procedure whereby a tooth is covered to strengthen a damaged tooth. The tooth may have been damaged by decay, or have a previous restoration that has fractured. Root canaled teeth are also crowned if sufficient tooth is missing or if the dentist feels that the tooth will last longer by protecting it with the crown. There are several types of crowns. The dentist and patient will make the decision as to which one is best for patient. This involves several phases. One in which the dentist prepares the tooth and a temporary is fabricated and used to temporize the tooth while the crown is being processed in a dental laboratory. The second step is inserting the permanent crown. Failing to return to have the permanent crown placed can cause damage to the underlying tooth due to weakness and poor fit of the temporary crown. A dental bridge is an appliance used to replace one or more missing teeth. These appliances are cemented into place and cannot be removed by the patient. As the name of this appliance implies, the bridge is made out of three pieces that fit into the open space in the mouth, "bridging" the gap. Most bridges are made of a pontic tooth (or false tooth), held together by two crowns (a "cap" that covers the tooth, approximating its normal size and shape). This trio is then attached (cemented) to the abutment teeth (the surrounding teeth of each side of the gap). A root canal is needed when the pulp or nerve of a tooth gets affected by decay or trauma. The blood flow within the tooth rushes to the site of inflammation in order to aid the tooth, but what occurs as a result is a pressure on the nerve endings which generates the pain response. Pain usually occurs at night or when lying down, can be triggered by hot or cold and can be occasional or continuous. What occurs is a slow progression whereby decay may invade the pulp space and travel through the canal and settle at the end of the root. What occurs is an abscess or swelling at this site. Other causes of nerve pain can be fractures of teeth, large fillings that are not tolerated by the pulp or constant trauma to the tooth. Occasionally, it is difficult to diagnose which tooth may be the culprit until localization occurs. Treatment involves cleaning the canal space by removing the infected or affected nerve, washing the space and filling the space with an inert, rubber-like material that helps seal the space. Bio-compatible cements are used with this material to seal any smaller openings. As with any procedure, success or failure of a procedure depends on the circumstances, infection and patient. These can be discussed with the dentist. After endodontic therapy, the patient will usually need a crown to properly restore the tooth. An extraction is the removal of a tooth or teeth that is non-restorable, non-useful, or harmful to the patient. There exists many systemic precautions, do's and dont's that should be discussed by each individual and the dentist. Post extraction precautions include some of the following: Pressure-bite on gauze or sponge over extraction site for at least 45 minutes after extractions. No rinsing or mouthwash use for at least 24 hours post extractions. Rinsing may be allowed after 24 hours depending on the patient, with warm salt water, i.e. 1/2 teaspoon salt in approximately eight ounces water every two hours. Best to still avoid mouthrinses. Avoid any pressure that may dissolve clot such as using straws, smoking, etc. Avoid brushing the first 24 hours. Avoid alcohol for a few days. If bleeding persists, important to call your dentist. If sutures were placed after extraction it is important to return for removal of sutures and to evaluate healing. If swelling occurs, which often happens after extractions, it can be minimized by placing an ice bag as soon as possible on the side of the extraction for a 15 minute interval and can be repeated every 30 minutes for the next six hours post-operatively. Ice should be used only on the day of surgery. For pain and infections, the dentist may require oral pain medications and/or antibiotics. This is a highly esthetic, non-metallic restoration that is bonded on the prepared tooth to restore the beauty, strength and function of the tooth. The procedure is similar to that of a crown, however, due to new techniques of minimal invasiveness, the dentist tries to maintain as much sound tooth structure as possible. An accurate impression is taken of the tooth, a temporary filling is placed and a porcelain restoration is fabricated by the dental laboratory. Upon return, the tooth is chemically prepared, and the inlay/onlay is bonded onto the prepared tooth. The bite is adjusted and polished. The tooth is once again functionally restored to its almost natural form. 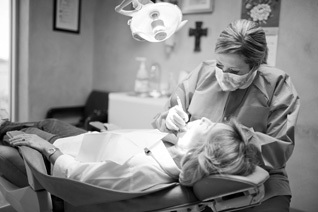 Prophylaxis is a procedure where a dentist or dental hygienist removes plaque and tartar from the teeth. This will make the gums and teeth healthier. It is not uncommon for patients to note that teeth appear slightly more sensitive after a dental cleaning. The reason for this is that plaque and tartar coat the tooth surface and shield them from substances in the mouth. Once they are removed a transient sensitivity may occur but soon leaves. It is important for one to brush and floss after every meal to prevent buildup of plaque and tartar. Periodontal scaling is a procedure whereby a dentist or hygienist removes the deposits from under the gum line. Plaque and tartar is removed from the root surface. The procedure is usually performed under local anesthesia so as to make the patient more comfortable. Many times it can be performed in two to four visits depending upon the amount of deposit or inflammation present. Dental implants are designed to provide the foundation for the restorative dentist to replace missing teeth to form and function. The patient has the ability to eat virtually anything. Facial contours and tooth space is also maintained by replacing missing teeth. Implants are fabricated of titanium posts which are inserted into the jaw bone where the teeth are missing. There are many different types of implants and the determination is made on examination and the degree of space, amount of remaining bone and individual choice of dentist. Once the implant is placed, a healing time is needed, which may take up to six months. Once the implant is ready, it acts as if it were a tooth root substitute, where the dentist can now perform his restorative treatment. Bleaching is a safe, effective way to lighten the color of teeth. We offer take home kits where a mold of the teeth are taken to fabricate bleaching trays which custom fit the patient's mouth. The patient wears these trays usually for 30-45 minutes or overnight depending on the product strength selected. Most treatment takes two weeks, however, more time may be needed in severely stained or discolored teeth. A procedure whereby a dentist uses special dental adhesives between tooth surface and another material. The tooth is first chemically treated with a special dental acid which causes microscopic porosites in the enamel. The adhesives form a bond with the bonding material. These materials come in various colors and shades. There are also flowable and dough-like materials. The dentist chooses the one he feels best suits the procedure he is performing. The materials at present are highly polishable, are very strong and most last quite a long time. Some even contain fluoride which aids in preventing new cavities from forming. Bonding uses include restoring chips, filling holes, spaces or discolorations. Composites are a plastic-like material in the resin family used as filling material for cavities. Unlike the older alloy fillings that left the tooth looking black, composites match the shade of your existing teeth and blend in to be unnoticeable. The newer generation composites have superior properties which include higher strength, hardness, elasticity, abrasion resistance and high polishability to make the restoration appear lifelike. Uses include cosmetic, filling cavities, correcting size, color and shapes of teeth. They can be used in front as well as back teeth. This is a removable appliance that is custom fabricated for the patient to replace missing teeth. The materials used are made of acrylic resins alone or in conjunction with various metals. A partial denture replaces some teeth where the patient has some remaining permanent teeth. A complete or full denture replaces all teeth. An immediate denture, whether complete or partial, involves placing the appliance the same day the teeth are removed. A mouthguard is an appliance made to protect teeth and surrounding tissue from oral trauma during athletic or physical activities. The mouthguard is custom made by the dentist. For children, they must be changed as new teeth erupt. It is known that mouthguards can prevent serious injuries such as jaw fractures, neck injuries, concussions, and teeth fractures. Studies have reported that concussions can be decreased by almost 50% by wearing a mouthguard. Any activity where there is a strong chance for contact, it is recommended that a mouthguard be worn. A mouthguard can also be used to aleve the symptoms of TMD. This a condition whereby jaw muscles, temporomandibular joints, and the nerves associated with this region cause pain. TMD most often affects women twice as much as men. The causes include, overuse of jaw muscles and trauma. The symptoms can include jaw pain, especially in morning, earache - with no infection-, jaw clicking when opening jaw, difficulty in opening mouth, stiff or locked jaw. The treatment would include resting of jaw, anti-inflammatory drugs (non-aspirin), stress management, eating soft foods, wearing a splint or mouthguard and avoiding chewing gum. Dental sealants are thin plastic coatings which are applied to the chewing surfaces of the back teeth to help prevent decay. Most tooth decay in children and adolescents occur on the chewing surfaces of these back teeth or molars. This is because molars have irregular surfaces with pits and grooves which tend to trap food and bacterial debris. Sealants flow into and coat these pits and grooves so that bacteria cannot multiply and cause decay. The teeth most likely to benefit from sealant applications are the first and second molars just after they have erupted and before decay has had a chance to occur. Generally, the first molars erupt at six years old and second molars at about twelve years old.